இந்தப் பாடல்களை 1983-ல் ஸ்ரீ மஹாபெரியவா முன் ஸ்ரீ.வெங்கடேசன் ஸ்ரீ பெரியவா ஆசிர்வாத ஒப்புதலுடன் பாடினார். பாடியபின் அவர் ஸ்ரீ பெரியவாளிடம் இதை யார் எப்பொழுது பாடினாலும் நீங்கள் அங்கு வந்தருள வேண்டும் என்று பணிவுடன் கேட்க ஸ்ரீ மகாபெரியவாளும் â€œவருவேன்â€� என்று ஆசி வழங்கினார். In 1983, Shri Venkatesan sang this poem in front of Mahaperiyava. 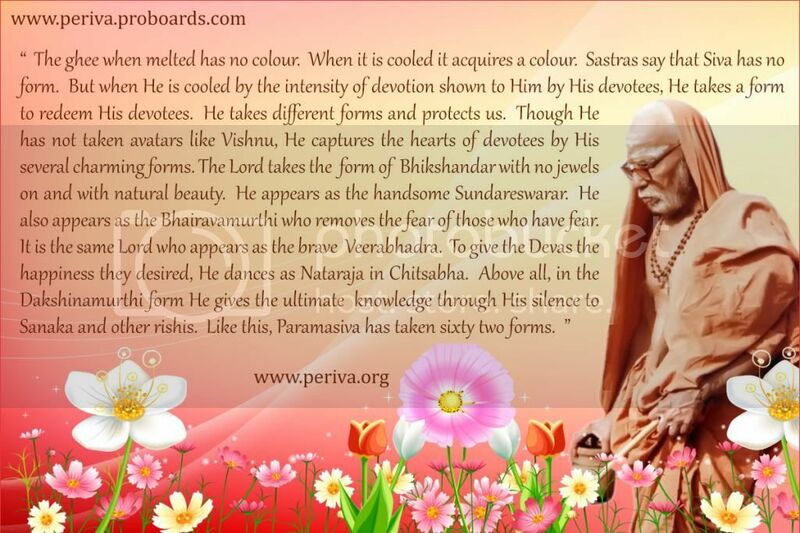 After completing this poem, he requested that any devotee whenever sings this poem, Periyava should come there. Periyava simply said â€�I will comeâ€œ. What a great and selfless devotee Shri Venkatesan, who was so kind enough to share his same experience and his blessings to all devotees in the world. Mahaperiyavaâ€™s anugraham is completely limitless! This incident was narrated by Brahmasri Vedapuri mama in this bookâ€¦.When I was typing this poem, I could enjoy each and every line â€“ simply amazingâ€¦. Nice composition on Maha Peruava. Thaniks. Time is fleeting. The night is wasted in sleep and pleasure. The day is wasted in idle talk, amassing money and maintenance of the family. Days, months and years are rolling away. Hairs have become grey. Teeth have fallen. You are attached to perishable objects through Moha. Tell me, friends, how long will you be a slave to the fleeting things of the world? How long are you going to repeat the same sensual enjoyments? How long do you wish to worship mammon and woman? When will you find time to meditate on the Lord and to do virtuous deeds? Think and reflect. Here Kanchi Paramachrya describes the state of a person who has crossed Mounam / Amounam state and one can clearly see from this explanation that Bhagavan Ramana clear fits in with what Kanchi Paramacharya has stated . going to sing in large chorus in Palace Grounds, Bangalore. About 10,000 participants are expected. It is true that even in the beginning of sadhana everything happens by Godâ€™s Grace. But during those times the JivAtmA was engaged in self-purification and for that to happen well Godâ€™s Grace helped. But now the purification task has reasonably progressed. Now the purified antaH-karaNa (inner organ) has to reach step by step the state of experience. â€˜Reachâ€™ is really not the right thing; unusually instead of â€˜reachingâ€™, now it is â€˜givingâ€™. As Manickavachagar said, it is a smart trading. One gives up the JIva-bhAva and receives the â€˜shiva-sthitiâ€™ (the state of being the Absolute). But even this is only true in a poetic sense or in the sense of bhakti. In reality, there is no JIva who receives the â€˜Shivaâ€™. JIva is gone but Shiva remains! individual self therin, That Hari, the destroyer of the darkness of samsara, I pray! When one knows "I am not", it is verily Brahman itself that knows "it is not"
When one knows "I am", then too, it is that Brahman itself that knows thus! for those that are devoid of the grace of the Master. நாம் â€œதானம் கொடுக்கிறோம்â€™ என்ற வார்த்தையைச் சொல்வதே தவறு.â€�பகவான் நம்மைக் கொடுக்கும்படி வைத்தான், கொடுத்தோம்â€™ என்று அடங்கி பவ்யமாகக் கொடுக்க வேண்டும். அகங்காரம் வந்துவிடுமோ என்று பயந்து கொண்டு கொடுக்க வேண்டும். நமக்கு எத்தனை ஆசை இருக்கின்றனவோ, அத்தனை ஆணிகளை அடித்துக் கொண்டு, நம்மை கட்டிப்போட்டுக் கொள்கிறோம். இதனால் துன்பம் அதிகரிக்கிறது. ஆசைகளை குறைக்க குறைக்க துன்பமும் குறைகிறது. ஒருவர் நம்மிடம் நெருங்கிப் பழகாவிட்டாலும் சரி, அவருக்கு ஆத்ம குணங்களும் அனுக்கிரக சக்தியும் இல்லாவிட்டாலும் சரி, அவரால் நமக்கு எந்தக் காரியமும் ஆகாவிட்டாலும் சரி, அப்போதும் நாம் அவரிடம் மாறாத அன்பு வைத்தால் அதுவே உண்மையான அன்பு. தியாகம் பண்ணவேண்டும். அதைவிட முக்கியமாக â€�தியாகம் பண்ணினேன்â€™ என்ற எண்ணத்தையும் தியாகம் பண்ணிவிட வேண்டும். மகான்கள் செய்கிற ஆசிர்வாதம், அவர்கள் கொடுக்கும் சாபம் அனைத்தும் அப்படியே பலித்துவிடுவதற்கு காரணம் அவர்களுடைய சத்தியத்தின் சக்தி தான்.